It seems that technology punctuates all aspects of our lives these days, including our passions. Whether you’re cycling, caravanning, playing music or enjoying another hobby, there are various gadgets that could make things easier. At The Insurance Emporium, we want to recognise how technology helps to enhance our hobbies and how taking good care of our gadgets could help them last. We’re also offering 4 weeks free* on our camera, cycle, caravan, music, fishing, golf and student insurance with the promo code TECH. Various pieces of everyday technology seem to prove useful across a range of hobbies. For example, GPS devices help cyclists seek out hidden trails, musicians find gig venues while on tour and caravanners travel to new holiday destinations. Your fitness tracker might also be used as part of a variety of hobbies – even if you’re just counting your steps on the golf course! Then, of course, there is the mobile phone. While it was once used for simple texts and calls, now photographers experiment with smartphone cameras, musicians record music on their phones, cyclists use theirs to track their bike rides and much more. The problem is, sometimes things could go wrong with these gadgets. For example, they could get stolen, lost or simply damaged purely by accident. That’s why it’s worth doing what you can to take care of your technology. Things like getting a protective case and a screen protector for your smartphone could help to keep it from getting broken. If there’s a chance that your devices might get wet – and they aren’t water resistant already – then consider purchasing a waterproof case or storing them inside a bag to keep the moisture off. Keep your gadgets out of sight to avoid theft. For example, lock your devices away in your house or hide and lock them in your car if you’re on the move. Most of all, when you’re out and about, don’t leave your phone unattended in case you forget about it or it ends up in the hands of an opportunist thief. At The Insurance Emporium, we want you to be able to freely enjoy your hobbies. 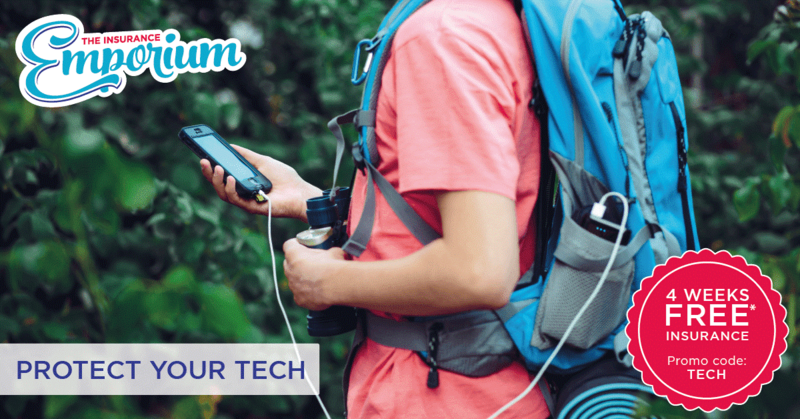 So, as well as encouraging you to care for any related gadgets, we’re offering 4 weeks free* on our caravan, camera, cycle, music, fishing, golf and student insurance with the promo code TECH. While you may or may not use any gadgets with these things, there are a number of gadget-related Elective Benefits that you could choose for your insurance policy! If you want to push the button on insurance for one of your hobbies, head to The Insurance Emporium today! *Offer ends 31/10/18. Available on our camera, cycle, caravan, music, fishing, golf and student insurance. Excludes pet, equine and wedding insurance. This offer is only redeemable on new monthly policies and not where premiums are paid annually.